During 16 years service with Her Majesty’s Royal Marine Commandos Alan Chambers operated in in the deserts, jungles and frozen tundras of the planet, travelling the world visiting over forty countries. He is formally qualified as a diver, parachutist, paramedic and ski survival instructor. 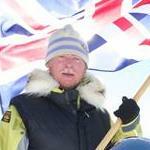 After spending five years researching, planning and training, Alan led the first successful British unsupported expedition from Canada to the Geographic North Pole. After a gruelling seventy days on the ice, Alan and team-mate Charlie Paton raised the Union Jack on top of the world at 23:16 hours on 16 May 2000. Only one in one hundred and fifty thousand people ever attempt to walk to the North Pole unsupported. Through determination, guile, resolute planning and motivation they succeeded against all odds. The ten-week expedition, which left the team ten days overdue, suffering extreme body weight loss and dwindling food supplies, was a catalyst for the future for Alan. Upon his return from the top of the world Alan, aged 32, was awarded the MBE by Her Majesty the Queen for Determined Leadership in Constant Adversity. He has since returned to the North Pole numerous times, making it possible for men and women to accomplish a dream. Alan presently delivers tailor-made talks and workshops for teams on communication, winning beliefs, teamwork and leadership.